Yesterday, I finished a big project and took the afternoon off to go paint some cabinets. Chris continued grouting, and sealed the stuff he'd already laid. 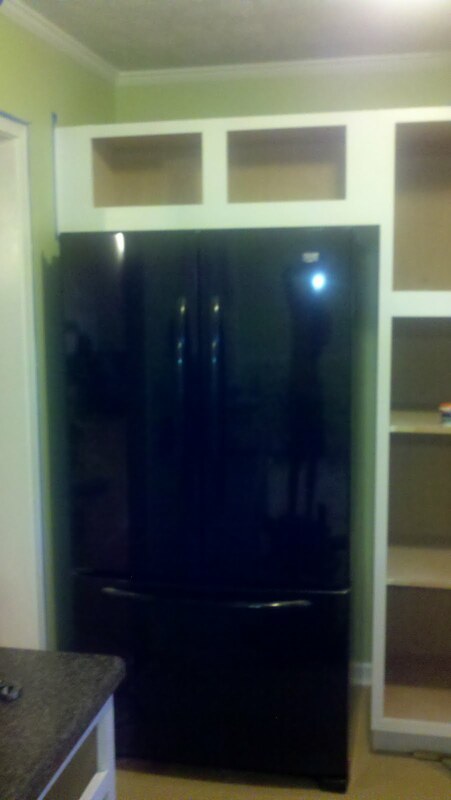 So, he'll be able to put the range in in about 2 days, and he put the fridge in place today! Here's a pic he e-mailed me. For all his fancy schmancy DroidX phone with camera flash, this is still a blurry cell phone pic. Ha. (I'm not bitter). You can even see his reflection if you look closely. but other than that, we're almost done! Once all that's done, THEN we'll have a finished kitchen.